​High performance impact driver with high efficiency brushless motor. Consistent driving throughout battery charge with minimal speed loss. High power brushless motor with maximum tightening torque of 210Nm (hard). 4 mode speed selection for a variety of jobs. 3 mode LED worklight: always on/automatic/always off. Side hook can be fitted on right or left. *As of July 2017. Among cordless impact drivers made by leading power tool manufacturers. (Surveyed by Hitachi Koki) Not compatible with the following batteries: BSL3620/3625/3626/3660, BSL18xx Specification is subject to change without notice. 36V Multi Volt batteries for higher power output similar to mains powered tools. Batteries are compatable with existing HiKOKI 18v tools. Offers unprecedented power output of up to 1080W. Power output similar to mains powered tools when used with a 36V tool*. Automatically switches between 18V 5.0Ah and 36V 2.5Ah depending on the tool in use. Fast charging - only 32 minutes with UC18YSL3 charger. 4 stage battery level indicator with diagnostic function. Compatible with existing 18V chargers and the new UC36YSL. Compact and lightweight - similar size and weight as existing 18V 5Ah & 6Ah batteries. Eligible for the extended warranty scheme when registered within 4 weeks of purchase. *Not compatible with previous non-Multi Volt 36V tools. Specification is subject to change without notice. 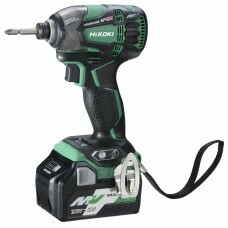 Online registration required within 4 weeks of purchase via hikoki-powertools.co.uk/service. Same size, more powerWith 36 Volts (V) the BSL36A18 Multi Volt battery packs have a capacity of 2.5 .. DETAILS HITACHI UC18YFSL BATTERY CHARGER 14.4V - 18VFEATURES:Takes HITACHI 14.4V & 18V slid..